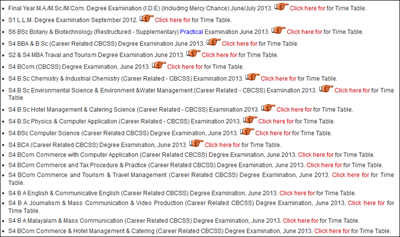 Kerala University exam timetable 2013, schedule and notifications are now available at the official website of the University. The University of Kerala is one of the top Universities in India having more than 250 affiliated colleges spread in Thiruvananthapuram, Kollam, Alappuzha and few parts of Pathanamthitta districts. The University conducts thousands of examinations for different courses in two sessions every year. Kerala University exam timetable 2013, schedule and notifications are now available at the official website of the University. Students who are studying in the colleges under the University can check the time table to know the schedule of the exams which can help them to prepare well before its commencement. As the time table is being published much before the exam date, it will give ample time for the students for preparation and to score high marks. The University of Kerala is one of the top Universities in India having more than 250 affiliated colleges spread in Thiruvananthapuram, Kollam, Alappuzha and few parts of Pathanamthitta districts. The University conducts thousands of examinations for different courses in two sessions every year. The University which has introduced many inventive methods has made a step forward by providing the single window online facility. This will enable each student studying in the University for Pre-examinations Enrollment, registration to University examinations and also for getting the scores in the examinations. Through this facility, colleges can submit details of candidates for examination registration and also can download hall tickets online from the official portal. The website is equipped with result analysis feature which provides quick and easy way for comparing the course wise and college wise performance of candidates in University examinations. Added to it, a bulk of external extensive resources related to various online procedures are available for download while numerous forms connected with examinations, fee details of different courses is also accessible from the website which makes the portal highly useful and user friendly to candidates and also for colleges too. Principals, teachers and students who study in various colleges under the University is making use of this online system to get updates about exams and news connected with the University. Kerala State higher secondary/plus two (HSE) school codes 2013 of districts like Alappuzha, Ernakulam, Idukki, Kannur, Kasargode, Kollam, Kottayam, Kozhikkode, Malappuram, Palakkad, Pathanamthitta, Thiruvananthapuram, Thrissur ,Wayanad, Arabian Gulf, Lakshadweep and Mahe are given here. These codes can be used to check the results online. The results will be declared on 8th May by Education Minister P K Abdu Rubb and later it would be published at the official government websites. Kerala Board HSE, VHSE 2013 Results online (Plus Two, 12th class higher secondary exam) on websites. The Results of Kerala State Board Higher Secondary Education (HSE), VHSE/ Plus Two (12th Class) examination 2013 will be available in the official websites of Kerala Pareeksha Bhavan after the official announcement of the result by the Education Minister of Kerala at 12 30 PM on 8th May 2013. The results of plus one examination will be published in the first week of June 2013. Read the below article to know how to get your result online from the websites.